Dear friends of the United States of America, Africa, Oceania and all Commonwealt Nations, let me here you translate the English version of the Manifesto of the Fraternity of Citizens of Quebec. We believe that this text can be adapted to all cultures and languages ​​used on Earth. We believe that allowing the philosophy of a global movement wanting to change the world, we increase the possibility of abolishing the New World Order, one day. This awareness perrmettra reflection for developing the transition to the New Era, in which we are joined recently. Thank you for reading and spread the vision for a better world. WE ARE FIGHTING … even if everything seems calm! Since the 2008 economic crisis, the Occupy Movement in Europe, the Occupy Wall Street movement in the U.S. and Occupy Movement Montreal Quebec show that millions of people in the world have realized that capitalism is enough! « We are the 99% » * and we do not think that the only purpose of humanity is to produce, consume and spend his life to compare prices in a market economy mondialisée.Il there for weeks or only things we hear on our workplaces in Quebec, are observations of increases or decreases in the price of gasoline, bread, butter and clothing. We will have to choose between the survival of a stupid and violent absurd system that makes profit and its sole purpose the survival of our humanity, our environment, our planet. So is the survival of peoples (99%) or is the survival of a controlled 0.01% of the population for his own choice bénéfice.Notre real social project system, and it is nothing other! Since the election of September 4, 2012, we were all surprised and amazed and shocked by the extent of the stranglehold of organized crime on the administration of the state. This control only affects not only the provision of contracts in the field of construction by corrupt administrators of our towns and cities, but also key to the administration of justice into our même.Nous are all able to see that many police officers have also been affected by this epidemic of corruption that shows us that this is a political system that is built on corruption and collusion. This is not just changing the Prime Minister and political party that we will change this state of affairs, we can clearly see, even very well with the latest political appointments and making economic and social positions of the current minority government of Quebec. We must look reality in the face of the problem in its full extent, if we define the remedy to administer. We, the people of Quebec can not even speak of a constitution that protects our rights, establishes our duties as citizens and citizens and defines the powers of the state and our elected officials. We do not even have a common paper speaks of « We the People » … or Equality, Fraternity or Equal legally, because this has been overlooked by our elected since the end of the mandate dernmier or the National Union for the first time, a serious political party had challenged and motto: Equality or Independence. We just have that laws passed in parliament whose legitimacy is douteuse.Comment otherwise explain the reform of 1968, which means the government of Jean-Jacques Bertrand was change the Legislature Act. Thus, it abolished the Legislative Council at the same time establishing a unicameral parliament which elected Chamber was named National Assembly. National Assembly … was named … without consulting the people itself! So we do not have democratically elected but firm direction from the British colonial institutions! So since Jean-Jacques Bertrand, any of the governments of the Quebec Liberal Party and the Parti Québécois could decide to pass a law declaring formal independence of Quebec, but they would never have done, because the status quo suited them and perpetuated the « state of lawlessness » colonialist! Wanting to liberate Quebec is to scrap first and foremost, the remains of the symbols of British imperialist monarchy. Want to release Quebec is wanting to clean things in the organization of government « legitimately elected by the people » starting afresh on a new solid base, a call to the People! Want to release Quebec is wanting to get rid of the dead wood that we administered under the false title fonctionnaire.Un top official in 2013 in Quebec, it’s a little Liberal or PQ friend who is lucky enough to be born at the right time and that is the right place when called to appoint its citizens poste.Les Quebec very familiar with the favorable pension of officials that they will continue to pay their taxes, even if they have not even right themselves and themselves to a pension fund that would tenth of these benefits généreux.La vast majority of Quebec and Quebec’s future generations will get by and survive in a world where descendants of the current senior officials will continue to waste public money. We need to include the words Liberty, Equality and Fraternity over the doors of our future National Assembly, because it, soiled by corruption, collusion, organized crime and the influence of secret societies, makes us shame and dishonor do not even deserve. I am ashamed of this impotent government since September 4, 2012, which was built on lies and continues to rely on political parties that we all know suspects.Le become the first gesture of Marois government would be ban and abolish the Liberal Party of Quebec when we all know his criminal links from years.The Charbonneau Commission has only put the facts to light. Rather than do the work with a minimum of courage, our ears are folded with the sovereignist Parti Québécois credo that everyone is questioning its application given the corrupt environment in which it bathes. We believe that the only meaningful political method of compliance would lead the fight against the mafia power banksters, multinational owned by oligarchic families diverted to Desmarais and Rothschild and powerful occult powers of organized crime interests, the n ‘ is that the dressing and the politicians who do not fundamentally challenge these occult powers, are either purchased or threatened, or idiots. We believe that the old system of making policies and the hiring of senior public service appointments are an affront; workers in Quebec and the need to reform the outdated system inherited from colonialism, dismissing the great most of the officials politiques.C is abolishing the privileges we will create equality so dear to the French Revolution of 1789. – We believe that the abolition of the current National Assembly, in its operation is the only « space » we have left to fight against this transnational oligarchy that wants to impose a global financial dictatorship, perpetuating a political system inherited another siècle.Nous are some of the people we need to modernize democracy and not retain a parliamentary anachronism that perpetuates social inequality by birth, wealth and political ties. We refuse to work as much as possible in all businesses adverse health and environmentally hazardous. We refuse to buy a press orders of financial power and fuel consumerism, marketing and lies. We refuse to submit to master sneaky but what the real « monetary system of Fractional Reserve » or, in other words, handling the money « debt » issued by banks. We refuse to vote for candidates in Quebec elections that will not address the problem with free money and do not offer their program to nationalize the banks so that the money becomes the property of the people and not a tiny minority hidden (EDF * and * Bilderberg Group). We propose to use less and buy healthy, local origins (Quebec buy first). We propose to boycott the products of multinational corporations (Monsanto, McDonald’s, Coca-Cola, Nestle, L’Oreal, etc.). We propose to stop borrowing from banks and make the most of our money from our account to leave only the minimum. We propose to inform us of the reality and truth of our society and make it known to our friends and our neighbors around the world. We offer live differently and develop more links with our neighbors, our colleagues and fellow citizens in general, throughout Quebec, Canada, the United States and around the world.We encourage our friends from all over the world to support the citizens of Quebec in their struggle for Freedom, Justice and his homeland. We caution the « corrupt political system in Quebec » that in the event too much tolerance towards corrupt politicos and corrupters of the Quebec Liberal Party, in the event that the gangsters are not sent to prison, and that even the Quebec Liberal Party wins the next general election in Quebec (Majority way), with 30% of votes for example, we would estimate that democracy will definitely dead in Quebec … and enterrée.Le use civil disobedience « muscular » is, at this time, became the last and only way to liberate « the Fatherland in Danger » and give him his only indépendance.Le way we will stop killing us and pick up our bodies, because you never have our respect and if you start do, we will be self-defense, we, your people of Slave Insoumis that puts you at the door of power and bin of history. We Quebec Patriots challenge you openly and without a mask! By their propaganda « The New Watchdogs » dictate « credible » speech and manipulate us to make us believe that there is no alternative to neo-liberalism and capitalism. Fortunately the internet is a good alternative to the boycott and ostracism practiced controlled by the oligarchy of the Desmarais family or the media to Peladeau. Wake up and do spread the word, we are millions! Send this text by e-mail, copy it on your blog, publish, print and distribute it everywhere and all the time! 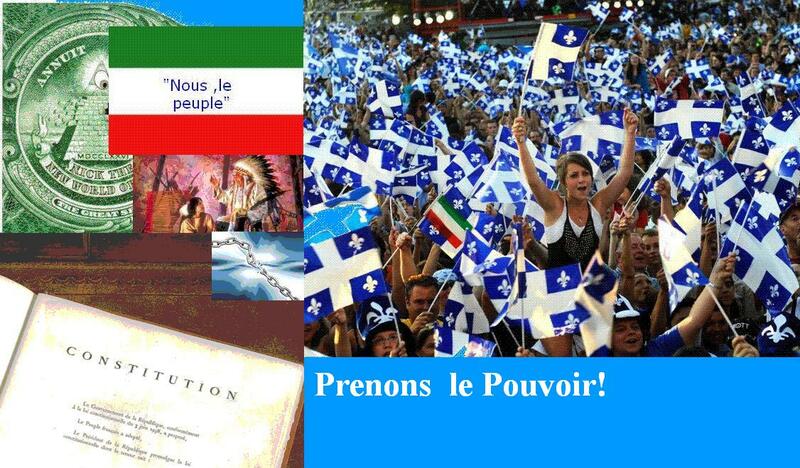 In a global spirit of brotherhood, of Quebecers have adapted this written by French citizens, in June 2013 text. We ask translators to Germany, Italy, Spain, the United Kingdom or elsewhere who would like to adapt the text to the cultural context of the country to keep the « spirit ». Our work is global and our goal is to unite us to propose an alternative to the New World Order! We live in a New Era; build the Future of Life and Hope for Generations to come! Senior Editor of the current text.